Can you believe it? The NFL franchise tag has been in use for 25 offseasons, dating to 1993 and the start of the free-agency/salary-cap era. So in this momentous year, let's look back at five of the best and worst franchise-tag decisions of 202 total from 1993 to 2016. Quality is based on the perspective of the team, rather than the player who was tagged, and is, of course, up for debate. The Redskins paid dearly to acquire Gilbert in 1996, sending the No. 6 overall pick to the Rams, so they wanted to get more than one season for their trouble. But Gilbert was a union-minded veteran who drove a hard bargain, and he sat out the 1997 season rather than play under the franchise tag. Rather than pay him, though, the Redskins used the franchise tag again and waited while the Panthers rescued them. Rather than getting saddled with a weighty deal the Panthers soon regretted, the Redskins turned Gilbert into a pair of future first-round picks. Sometimes, teams use the franchise tag to increase trade return. The Bills capitalized on Price's career year -- 94 receptions, 1,252 yards, nine touchdowns -- in 2002 to dangle him with the tag the following offseason. The Falcons were known to regret passing on Price in the 1999 draft and still wanted him as a weapon for quarterback Michael Vick. Atlanta surrendered its first-round pick in 2003, No. 23 overall, for a player the Bills weren't planning to bring back. In turn, the Bills used the pick on tailback Willis McGahee -- who sat out his rookie year while recovering from a knee injury but then produced 3,365 yards and 24 touchdowns from 2004 to 2006. Haynesworth was one of the NFL's most dynamic and confounding interior disruptors at the time, and the Titans did not meet his demands for a long-term deal. They let him play out the 2008 season under the tag, getting a career-high 8.5 sacks and three forced fumbles from him, and then let him sign a monster free-agent contract with the Redskins in 2009. (By prior agreement, the Titans couldn't tag him again.) 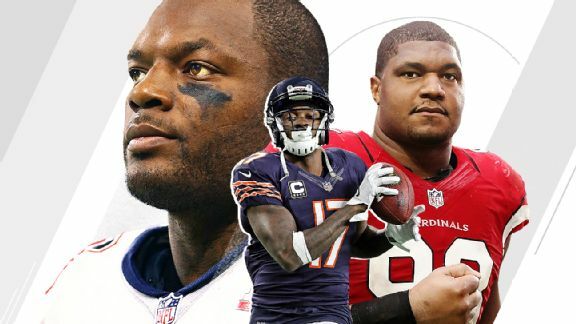 His new deal -- which included a then-record $41 million in guarantees -- turned out to be one of the worst in free-agent history. Haynesworth was totally disinterested in playing, was traded after appearing in only 20 games and was out of football by the end of the 2011 season. Whether by design or accident, the Titans got out from under him just in time. In part because of their shrewd/ruthless use of the tag, the Bears got eight highly productive years from Forte at an overall average of $4.375 million per season. Between 2008 and 2015, no running back had more combined rushing/receiving yards than Forte (12,718). The Bears made him a low offer in 2011, knowing they could use the tag in 2012 if needed. Forte turned it down, and the following year, the sides agreed on a four-year deal worth $32 million. At the time, Minnesota Vikings tailback Adrian Peterson was earning more than $14 million per year. Forte's compensation remains one of the most stark examples of how the franchise tag can suppress the salary of high-end players. In truth, this two-year arrangement worked out well (financially) for both sides. In 2012, Spencer delivered the Cowboys a career season. He totaled 11 sacks and 95 total tackles in 14 games, in exchange for about $8.8 million. The Cowboys franchised him for a second consecutive year in 2013, at a cost of $10.6 million. Spencer then suffered a knee injury that required microfracture surgery. He played in only one game that season and was out of football by 2015. So in the end, the Cowboys were able to pay as they went rather than commit to a long-term deal. And Spencer received a total of $19.4 million over two years, at least as much if not more than he would have taken in over two seasons of a multiyear deal. Let's be clear. The Seahawks made a great decision to franchise Galloway, even though he was 29 and had caught only 22 passes in 1999 after an eight-game holdout. The Cowboys made the huge blunder here. They were so infatuated with the idea of adding a playmaking receiver that they sent two first-round picks to acquire Galloway's rights. He never produced a 1,000-yard season for them and scored only 11 touchdowns in three full seasons before being traded again in 2004. The Seahawks used the picks to select running back Shaun Alexander in 2000 and receiver Koren Robinson in 2001. In this case, the Seahawks erred in not using the franchise tag. Hutchinson was an All-Pro player who wanted elite money at a position that rarely got it. The Seahawks used the transition tag, which offered them only the right of first refusal, to let Hutchinson find his true worth on the market. He did, signing a precedent-setting $49 million offer sheet with the Vikings that contained a "poison pill" that made it impossible for the Seahawks to match. In the end, the Seahawks got too cute and received no compensation for losing a Hall of Fame player that they wanted back all along. To be fair, the Panthers extended the tag three months before Hardy was charged with assaulting his ex-girlfriend. He already had signed the tender by the time the incident occurred, preventing the Panthers from rescinding it. But in the end, the Panthers got only one game out of him (and one sack) while still paying the entirety of his $13.4 million salary. Almost no production, and nationwide scorn, proved a double scar for the franchise. A 26-year-old pass-catching tight end who had produced 127 catches and 10 total touchdowns over the previous two seasons? Clay sure seemed to be a keeper. But the Dolphins apparently weren't convinced. They passed on the $8.347 million franchise number in favor of the $7.071 million transition tag. That decision, worth $1.276 million in potential savings, cost them a player they are still trying to replace. Clay signed a massive offer sheet with the Bills. The Dolphins didn't match. After veteran Jordan Cameron fell short the past two seasons, the Dolphins will finalize this month a trade for another tight end, Julius Thomas. Clay, meanwhile, has caught 108 passes for the Bills. I did my best last season to justify and explain the Panthers' thinking here. There was absolutely an argument to make for allowing a 29-year-old cornerback to move on, especially by a team that philosophically favors building from the interior, rather than committing to multiple years of eight-digit salaries. But you must have a reasonable plan for replacement, and the 2016 season proved the Panthers did not. They ranked No. 24 in defensive QBR, allowing the fourth-most passing yards in the NFL (4,291), despite a pass rush that recorded 47 sacks -- second most in the NFL. If nothing else, the Panthers should have allowed Norman to play out the season on the franchise tag and then parted ways.